Filtered water from the tap does not have to be expensive. Aquasana makes value- and performance-oriented water filtration systems for the whole house, the sink, the shower, or the countertop. 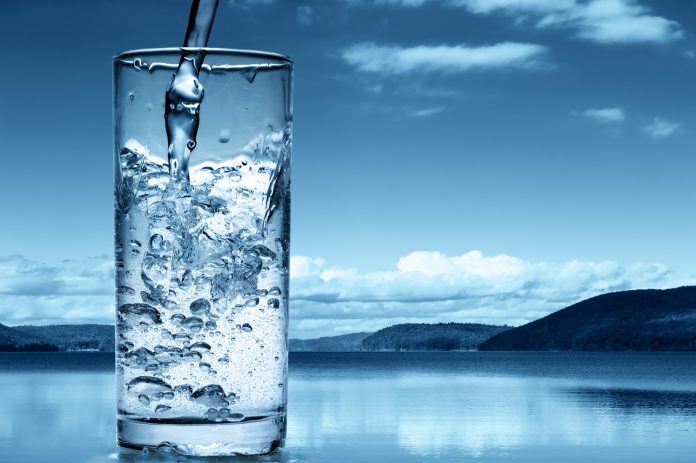 Find out about Aquasana’s line of filtration systems and water filter technology to choose the right purifier for your water source and daily use. What Are Aquasana Water Filters? Aquasana makes affordable and effective water filters and filtration systems. They reduce chlorine and other chemicals and contaminants found in city or well water from every tap in your home or from certain sinks or showers. Most filters are designed to last for thousands of gallons and months of daily use. The brand's whole-house system relies on Rhino tanks and filters to purify anywhere between 500,000 and 1,000,000 gallons of water over five to 10 years before needing to be replaced. Aquasana’s under-sink and countertop filters rely on the brand's proprietary Claryum technology to lower the levels of 77 known water contaminants. The company also makes a filtration system designed for well water as well as a reverse-osmosis filtration system that removes fluoride from municipal water sources. The specifications of Aquasana’s water filtration systems vary depending on the filter design. This review covers all of Aquasana’s filters as well as the brand's proprietary Claryum filtration technology. Aquasana makes two whole-house filters for city or municipal water and one system designed for private well water. City water is usually treated with chlorine, fluoride, and other additives such as chloramines. Regional water supplies may also contain contaminants, including traces of heavy metals, herbicides, industrial chemicals, pesticides, or volatile organic compounds. Customers with city water can choose the EQ-600 Rhino model rated for 600,000 gallons over six years or the EQ-1000 Rhino model rated for 1,000,000 gallons over 10 years. The EQ-600 and EQ-1000 models are both 46 inches high with diameters of 9 inches and flow rates of seven gallons per minute. Both of these whole-house filtration systems come with sediment pre-filters designed to trap rust, sediment, and silt. 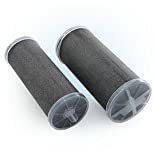 Activated carbon filters and sub-micron post-filters reduce chlorine by 97 percent, filter out scale and water-soluble heavy metals, and inhibit the growth of algae and bacteria. The whole-house filtration system that is designed for use with well water is rated to filter 500,000 gallons over approximately five years. Private well water may contain elevated levels of iron, ferric bacteria, or viruses, and it is not treated with chlorine. The EQ-Well model comes with an upgraded carbon media, a larger and longer-lasting 20-inch pre-filter, a sub-micron post-filter for removing particles as small as 0.35 microns, and the Sterilight ultraviolet filter to kill 99.99 percent of bacteria, cysts, and viruses. This base unit measures 57 inches high and 10.5 inches in diameter and has a flow rate of seven gallons per minute. Improve the condition of your skin and hair by installing an Aquasana water filter in every shower in your home. The company's shower filters contain media that is certified for NSF Standards 42 and 61. It is made out of AquaSorb HX coconut shell carbon that works to lower levels of chlorine and synthetic chemicals. KDF 55 Process Media contains a copper and zinc blend to further reduce chlorine and balance the pH level of shower water. Choose a premium shower filter compatible with most 2.5-gallon-per-minute shower heads, or a model with a massaging shower head attached. Aquasana also sells filters connected to white or chrome detachable wands. 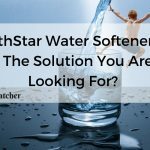 All of these options work with the same replacement filter rated for 10,000 gallons or six months, and these systems and replacement filters qualify for discounts through the Water for Life subscription program. Aquasana under-sink water filter systems use Claryum filtration. This proprietary system combines activated carbon and catalytic carbon filters with pre- and post-filtration to remove particulates, promote ion exchange, and provide sub-micron mechanical filtration. This technology meets NSF Standards 42, 53, 401, and P473, reducing levels of 77 known water contaminants. The Claryum system lowers levels of chlorine, chloramines, chlorine-resistant cysts, lead, mercury, organic chemicals, and pharmaceuticals. These filters leave beneficial minerals such as calcium, magnesium, and potassium in the water. Aquasana sells a wide range of under-sink drinking water filters, most of which require the installation of a designated faucet. The Aquasana AQ-5200 is a basic two-stage filtration system. This filter is rated for 500 gallons and has a six-month operational life. If you are seeking a three-stage system, consider the AQ-5300. This model filters up to 600 gallons, and the smart system provides filter-change notifications. The AQ-5300A model is a three-stage filter with a higher capacity. The AQ-5300+ is an upgraded, max-flow filtration system with three stages, an under-counter design, and a designated faucet. This Bluetooth-enabled model has a capacity of 800 gallons and sends alerts when it is time to replace a filter. You can easily place an order through the iOS application. This app also makes it simple to view statistics on environmental impact, gallons filtered, and money saved compared with bottled water. Aquasana also sells the OptimH20 Reverse Osmosis + Claryum system, a specialized filtration option that removes fluoride and up to 88 contaminants from water. This broad-spectrum filter eliminates up to 95 percent of fluoride, 97 percent of arsenic and chlorine, and 99 percent of asbestos and lead. It also provides remineralization to regulate the alkalinity and pH balance of drinking water. This system requires the installation of a separate faucet. Bypass complex installation procedures by purchasing an Aquasana water filter designed for countertop use. 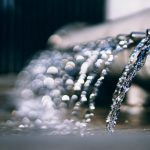 The company sells a Claryum countertop filtration system that connects directly to a primary faucet as well as a free-standing Clean Water Machine. The Claryum countertop system is an affordable and effective alternative to filtration pitchers. Screw on the faucet attachment and enjoy 450 gallons of filtered water from the tap for six months before you have to change the filter. The Clean Water Machine relies on electricity to quickly filter water. This system is up to 10 times as effective as and lasts up to eight times longer than filters in standard gravity pitchers. The powered filtration mechanism provides instant filtration rather than requiring users to wait as water slowly trickles over filtration granules. The Clean Water Machine removes 99 percent of asbestos and lead as well as 96 percent of chlorine, chloramines, and other contaminants. 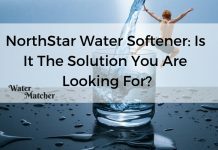 This system has a slim profile to maximize countertop space and comes with a half-gallon pitcher that can be stored in the refrigerator for chilled water. The filters in this system are rated for 320 gallons or approximately three months of use. The Clean Water Bottle is the most affordable and portable water filtration solution made by Aquasana. This strikingly designed 22-ounce bottle costs less than $ and removes more than 99 percent of bacteria, chlorine, cryptosporidium, giardia, and lead. The filtration media designed to go in this bottle includes electrostatically charged nano-fiber membrane technology with absorption, mechanical, and ion-exchange filtration mechanisms. Each bottle filter is rated for 80 gallons, which is enough to replace more than 600 waste-generating plastic water bottles while saving you money. Simply soak a replacement Aquasana water filter, attach, fill, and drink. 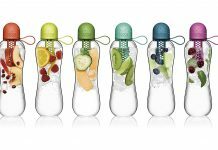 This design features a flip-top cap and consists of BPA-free plastic, borosilicate glass, and a non-slip sleeve. Aquasana sells filtration systems and replacement filters at affordable prices. Join the Water for Life subscription program for 15 percent off replacement filters and some filtration systems, as well as free shipping. While Water for Life subscription discounts are not available for whole-house systems, these discounts do apply to shower filtration systems and replacement filters for shower, under-sink, and countertop filters. Aquasana whole-house water filters start at $$ for the 600,000-gallon EQ-600. The 1,000,000-gallon EQ-1000 is priced at $$. The 500,000-gallon EQ-Well sells for $$$ and comes with a Sterilight UV filter. Add a UV filter to the EQ-600 or EQ-1000 for $$$ or a salt-free water softener for $$$. A replacement UV lamp for any Sterilight system is priced at $$. A four pack of replacement pre-filter cartridges for these whole-house systems sells for $19.95 for 10-inch cartridges or $29.95 for 20-inch cartridges. A post-filter for these systems is priced at $29.95. Replace the 600,000-gallon whole-house Rhino tank for $470 or the 1,000,000-gallon tank for $645. Shower filters compatible with 2.5-gallon-per-minute shower heads start at $$. This system is discounted to $$ with a Water for Life membership. A model with a built-in shower head sells for $$ or $$ with discount. Purchase a filtration unit with a white detachable wand for $$ or $$ with membership. Or buy a model with a stylish chrome head for $$ or $$ through Water for Life. A replacement shower Aquasana water filter retails for $$ or $$ with a Water for Life membership. The Aquasana AQ-5200 two-stage Claryum system with faucet is priced at $$. The AQ-5300 three-stage system currently sells for $$ while the Bluetooth-enabled AQ-5300+ max-flow system is priced at $$. The combined OptimH20 Reverse Osmosis + Claryum system starts at $$. Replacement filters for the AQ-5200 system are priced at $$ or $$ with subscription. Cartridges for the AQ-5300 are $$ or $$ with discount, and filters for the AQ-5300+ system sell for $$ or $$ with membership. The reverse osmosis system calls for several replacement components on slightly different timetables. A package of stage one and three filters sells for $$ or $$ with membership, while base stage one and three filters are $$ or $$ with discount. A replacement membrane for the RO3 is $$, and a re-mineralizer for this system is $$. These components are not filters and are not eligible for Water for Life discounts. The Claryum countertop system that connects to a primary faucet is priced at $$. Replacement filters for this system are $$ or $$ with membership. The powered Clean Water Machine starts at $$. A set of filters for the Clean Water Machine and other powered Aquasana water filtration systems is also priced at $$ or $$ for Water for Life members. The innovative Clean Water Bottle with built-in filtration starts at $$, and each $ replacement cartridge filters approximately 80 gallons of water. Purchase a two-pack of filters for $$ or $$ with discount. Water for Life membership reduces the price per filter to about $. 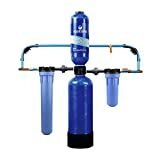 Purchase Aquasana filtration systems and water filters directly from the manufacturer or from online marketplaces such as Amazon. You can get the best deal on filters by joining the company's Water for Life subscription program, which provides 15 percent off filter purchases and free shipping. There are a wide variety of filtration options, including whole-house, shower, under-sink, or countertop systems. 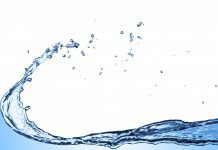 The Water for Life membership program provides lower Aquasana water filter prices, discounts on some filtration systems, and free shipping. Most systems reduce 77 common water contaminants. Some owners with whole-house or under-sink systems experience leaks. Aquasana makes a variety of water filtration systems. Choose a whole-house system to dispense filtered water from every tap in your home. Increase the purity of drinking or shower water with specialized systems. Every system comes with equipment necessary for installation and an Aquasana water filter. Purchase replacement filters from the manufacturer and subscribe to the Water for Life program for a 15 percent discount and free shipping. You can also purchase Aquasana filtration systems and replacement filters from Amazon or other online vendors. Aquasana makes affordable and effective water filters and filtration systems. Most filters are designed to last for thousands of gallons and months of daily use.